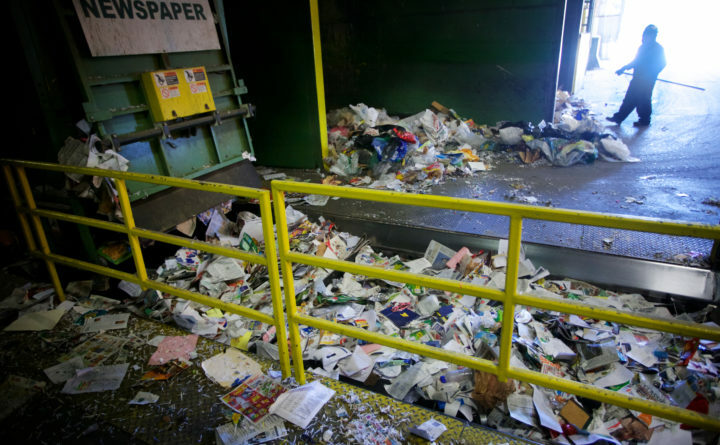 A worker at ecomaine in Portland presorts paper before it is bailed for recycling. KENNEBUNKPORT, Maine — The Board of Selectmen recently discussed the future of recycling in town, with Kennebunkport’s contract with Oceanside Rubbish, now Casella Waste Management, set to expire on Aug. 30. The cost to the town to provide recycling services is currently $43,071 which is the cost of transportation only. There is currently no cost associated with the disposal of the recycling, but Town Manager Laurie Smith said the current market for recyclables has dried up, and the costs will rise significantly. “The recycling market has changed dramatically. As of today we received a memo that Ecomaine is charging $130 a ton for processing recycling,” Smith said during the board’s Feb. 14 meeting. Director of Public Works Mike Claus said the town currently recycles about 400 tons a year at no cost other than the tipping fee of $43,071. Smith said the new figures will increase the cost of waste services in the town by 20-30 percent, or roughly $70,000 a year. The cost for trash disposal is $74 a ton, nearly half the cost of recycled materials in the current market. Currently, the town recycles every other week, and the board grappled with the increased cost, suggesting that changing or even eliminating curbside recycling might be the answer. Recycling is 14 percent of the total waste in town, and Smith noted that recycling may still be crucial to many residents who have said environmental issues are very important to them. Claus told the board that food waste is a big part of the waste stream, and a town composting program could be the biggest bang for a buck. “We could look at compost bin programs. If we are looking at reducing our impact,” he said. Smith suggested that the board consider forming a town committee to explore new programs and ideas.